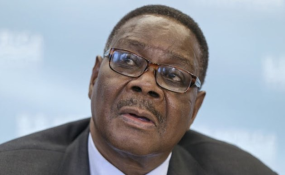 Chikwawa — President Arthur Peter Mutharika has warned of tough action against those who will be found involved in stealing relief items meant for disaster victims. The president sounded the warning on Monday when he visited flood victims currently staying at Chikuse Camp around Nchalo in Chikwawa District. The president said he was aware that some ill-minded people were busy stealing and hiding relief items meant for the flood victims, saying severe action would be taken on them. "Let me warn all of you who are trying to steal from the disaster-affected people. I know some people are busy hiding the relief items while others are putting their relations on the beneficiary list. "Let me tell you, that is bad and you will be punished for that. I will pin you down and serve a six-month jail term," said Mutharika. The President then called on all the affected families not to lose hope but have faith in government and God that all was well. Minister of Homeland Security, Honourable Nicholas Dausi urged chiefs to seriously conduct the distribution of relief items with transparency and accountability. "Our president has ensured that each and every affected household gets assisted. May I request other nongovernmental organizations and other political parties to come together, this is the time when a lot of people need our help," said Dausi. On his part, Chikwawa District Commissioner, Lusizi Nhlane said the heavy rains that poured between March 5 and 10 March left scores of people stranded in the district. He said 53, 765 people were affected translating to 12, 755 households. "There are 56 child headed households in the camps, 5,210 female headed with 7,488 male headed households. "Chikwawa district has so far opened 34 camps for the disaster victims. As a district, we have lost nine people while two are still missing," said Nhlane.